IBM MobileFirst for iOS Passenger+ lets flight crews offer personalized in-flight services – including special offers, re-booking and baggage information. 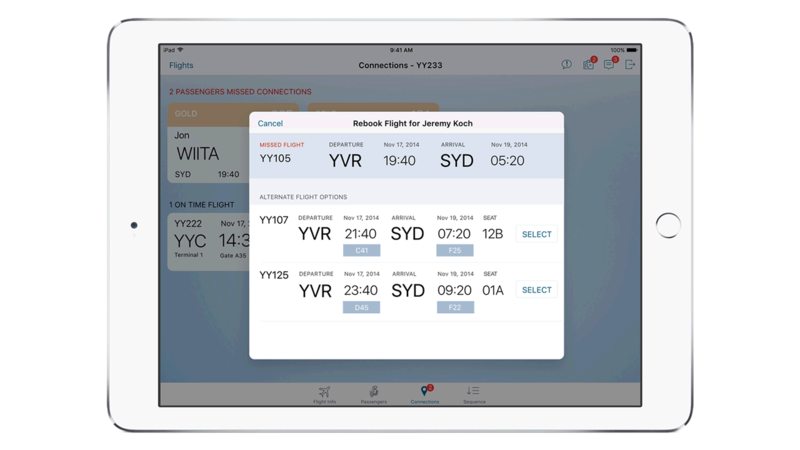 IBM MobileFirst for iOS Passenger+ allows flight crews to rebook flights while in transit, as well as offer other personalized services to passengers in flight – including special offers and baggage information. Flight delays are more and more commonplace, as airports struggle to keep up with growing demand. Previously flight attendants could only act as sympathetic witnesses to passenger delays, but could not tackle them head on. Now flight crews can offer services to passengers in flight to turn inconveniences into opportunities and demonstrate outstanding customer service. Flight attendants can tap into an intuitive dashboard on iPad to identify VIP passengers, see who’ll be missing connections and view up-to-the-minute alternative flights. Access airline reservation systems from the air to re-book delayed passengers to new flights. After landing, passengers find e-ticket confirmations in their inboxes and can add it to Passbook on their iPhone. Report maintenance and equipment issues while in flight and avoid lost time on the ground after landing.